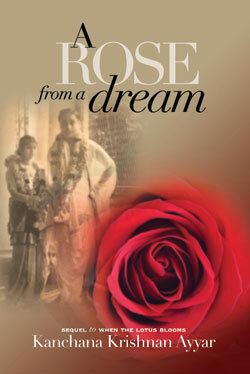 A Rose from a Dream, the spellbinding sequel to When the Lotus Blooms, weaves through the turmoil in the lives of diverse families, rich and poor across India, in the fading years of the British Raj. The novel captures the ethos, sentiments, memories and character of a generation that shaped the future of a nation at a crucial time in its history.The Brown Sahibs, Mahadevan and Inspector Swaminathan, are torn between loyalty to the crown, and a deep rooted patriotic fervor.The Revolutionaries, Vaithee and Nandu, are forced into a world of violence to protect their communities and extract revenge during the calamitous Great Bengal Famine of ’43 and the brutal Calcutta riots of ’46.The Devadasi, Bala, despises her life as a prostitute, longs for freedom from the care of courtesan Kamalamba, and yearns for love in the arms of her forbidden paramour. Against this tumultuous backdrop, the tender love story of Kamu and Kandu blossoms despite the intriguing contrast of their distinctly different upbringings. The two are destined to cross paths, blending the traditional and the modern, symbolic of India’s uncertain future at the dawn of nationhood.